This compote can be served after a meal with cheese or as a winter breakfast with yogurt. It is best made in advance to allow the flavours to develop and blend together. Simply warm it through over a gentle heat when you are ready to serve. Cut the dates in half and remove the stones. Place in a medium pan with the figs. Pour over the cider or apple juice and stir in the cinnamon, star anise, ginger and orange zest. Bring to the boil and simmer over a gentle heat for 1-2 minutes, then serve warm. Alternatively cool and chill in the fridge for up to one week until ready to use. Just before serving, warm the compote in a pan, if desired. Remove the cinnamon stick and star anise and serve with a selection of cheeses, such as Cropwell Bishop Stilton or Waitrose Blue Wensleydale and Brie, and Waitrose Organic Oaten Biscuits. 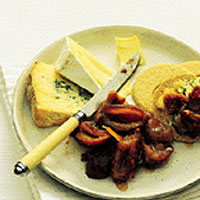 This compote goes well with most cheeses, but Brie, Waitrose Blue Wensleydale or the award-winning Cropwell Bishop Stilton are particularly good choices.